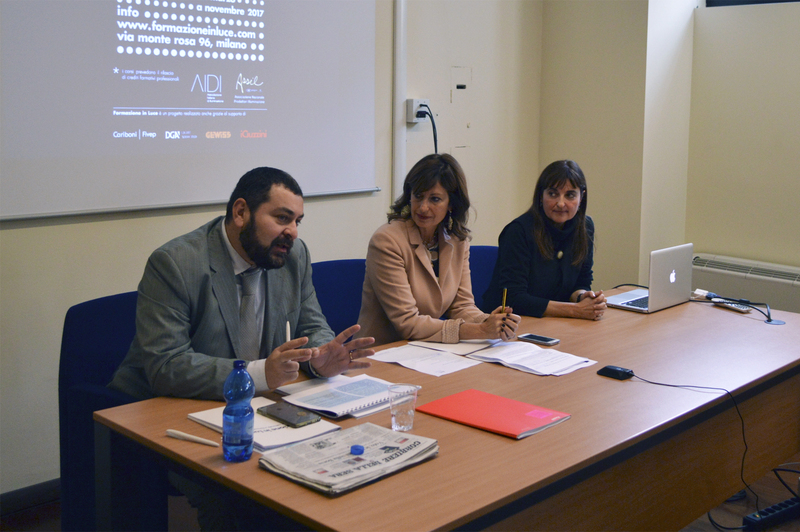 Tuesday, October 29 th 2016, Massimiliano Guzzini president of ASSIL ( Italy’s lighting systems producers association) and Margherita Suss president of AIDI, disclosed the “Formazione In Luce” the joint cultural project aimed to update the professional figures of the enlightment sector. Conference was hosted by Mariella Di Rao. The teaching plan is the first step of a wider strategic partnership, has been originated by a Memorandum of Understandings of both associations, whose purpose is to promote the development of professional figures, industry and market. Formazione in Luce will count 9 courses focused on the world of light, where official recognition is provided to Architects and Engineers that are going to participate. Topics range from Retail and residential lighting to street one, offices and Places of Worship, as well as public tenders or energy-saving appliances. “the engine of development and internationalization is Innovation, states Massimiliano Guzzini, president of ASSIL. Innovation in fact, flourishes & spreads only in a cultural environment. Networks, continuous education and capability to implement synergies, are crucial. ASSIL and AIDI have the common objective in developing an industry and its professional figures to the highest standards. This is the reason why we created a Memorandum of Understanding, we want an increasingly competitive lighting industry at a national, European and worldwide level. Thanks to ASSIL’S deep knowledge of regulamentations and the AIDI’S expertise in education and development of light appliances, a fast-evolving sector in an advanced cultural environment is about to be created. That’s the reason why I’m proud of “Formazione in Luce” project, that is the first step of a wider collaboration of AIDI and ASSIL. Importance of education has been underlined by Margherita Suss, AIDI’s president as well. “Education is a strategic asset for personal development and is going to become much more relevant in a context like the current one, in wich, increasingly specific knowledge, capabilities and attitudes are required. Acquiring new professional capabilities is one of AIDI’s strategic lever, a necessary advantage to stay on the market. It boosts every stakeholders’ satisfaction in wich lighting must define volumes and space functions, keeping up with what the future is going to bring. I strongly encouraged this initiative with ASSIL to handle the most important themes in their full complexity: technology, regulamentations, aesthetics, enhancing their value as well. In addition to “Formazione in Luce” project, ASSIL&AIDI are about to begin some other synergic projects: articles, events, joint meetings and technical ones, whose aim is to deveop, harmonise and make easier all the set of related regulamentations, and to extend the representativity of associates to research and national institutions, on lighting-related topics. the www.formazioneinluce.it website, has on-line enrollment capabilities, in addition to that all informations on courses are available. ASSIL – Associazione Nazionale Produttori Illuminazione is part of ANIE Confindustria, and regroups 80 device producers, electrical components for lighting, light&LED sources, among the most representative ones in the sector. ASSIL firms generate 60% (2,5 billion euro) of its turnover, employing 8000 people. Its mission is to represent, defend and support associated firms to facilitate growth of a quality industry based on Innovation and internationalization. Formazione in Luce is supported by Cariboni Group, DGA Srl, Gewiss Spa and iGuzzini illuminazione Spa. AIDI associazione Italiana di Illuminazione counts more than 300 individual members and 65 corporate ones,and, through its local branches, fosters education on technique and culture related to lighting issues. AIDI mission is the spread of knowledge related to lighting and promotion of study and research, to facilitate the development of its applications.